As mastering engineers, we have all heard people describe our job as “making it louder”. We adjust gain levels, we use compression, and we limit to achieve these results. To a listener, it is louder and reaching for the volume adjustment becomes less of a necessity. To us, it is a careful combination of tools based on what a song needs to sound its best. Limiting is most often the last stage before dithering and its importance cannot be overstated. 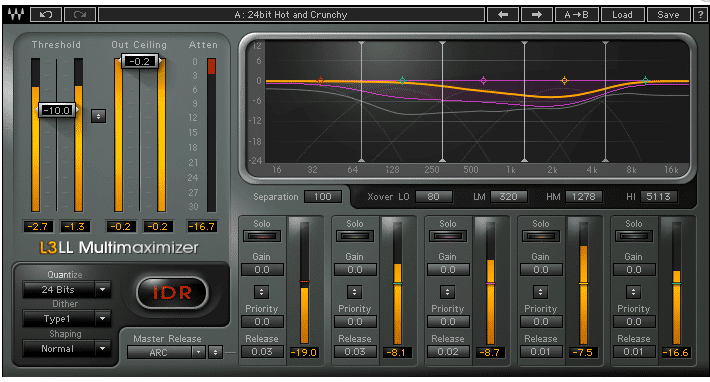 Using a limiter aggressively can squash the life and dynamics out of a mix at the last stage. On the flip side, using a limiter too sparingly may not bring up the low level parts of your mix, leaving your mix with dynamic range that may be too expansive for the genre. In the world of digital audio, engineers should familiarize themselves with the effects of different plugin limiters. Below are some of the plugin limiters that have proven to be effective for in the box mastering. FabFilter has changed the game for many engineers. The most highly regarded aspect of the plugins they create is the user interface. Their plugins often give great options when it comes to metering in the UI, such as the spectrum analyzer built into the EQ. The same applies with the Pro-L. This limiter keeps tabs on loudness metering, adhering to popular loudness standards (EBU R128, ITU-R BS. 1770) as well as true peak metering for accurate results. Tonally, the Pro-L adds a bit of richness to a mix but still remains pretty transparent. If completely transparent limiting is what you’re after, this limiter may not be the tool for you, but many of its features make up for the slight addition of color. The Pro-L offers dithering as well as control over channel linking with individual settings for transients and release. This comes in handy if there is a loud transient in only one of the two channels. You can unlink the transient setting to tame these types of issues while still allowing for a consistent release time on both channels. 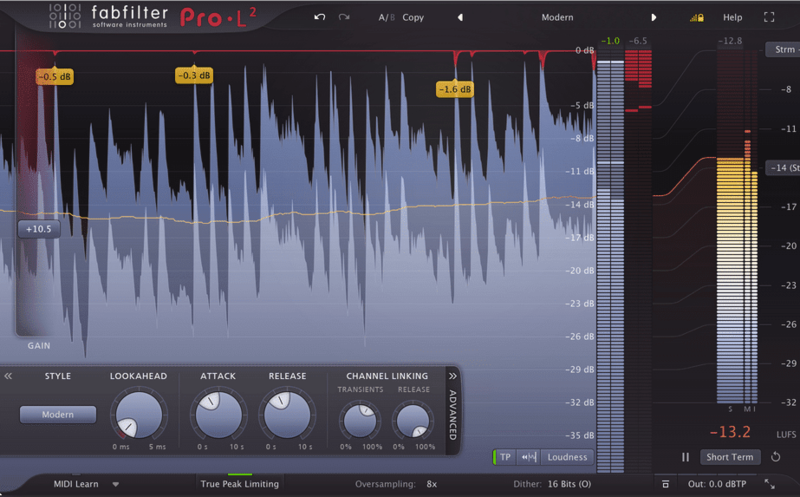 If you want a versatile, feature-laden limiter in your mastering arsenal the Pro-L is a good candidate. Building off of the success of the previous L series plugins, Waves decided to up the ante with the L3-LL. This limiter sports 5 separate bands for precise control over which frequencies are being limited and how. Unlike many multi band limiters, the L3-LL is controlled by one limiter rather than 5 individual limiters. Waves accomplishes this by using their proprietary PLMixer to measure with psychoacoustic accuracy how much gain reduction to apply to each band. The L3-LL can also be used as a mastering “EQ” using the priority controls of each band, giving you further control of how the plugin will affect the sound of you mix. Waves also utilized its IDR (Increased Digital Resolution) technology in this limiter to help maintain the best possible and perceived file resolution. Dithering with noise shaping is available on this limiter as well for those looking to use this as a final step in their file preparation. Sonically, the L3-LL aims to be transparent, but when it is pushed, it has a sound that is similar to the Waves L2. The beauty of this plugin is that limiting can be applied to frequency ranges where it is needed, rather than putting the entire mix into the same setting. This limiter may be for you if you need flexibility or want very precise control over what parts of your mix are being limited and how. The need to be transparent in limiting can be paramount on certain projects. Not only done this allow the mix to shine through, it also allows for the cleanest results all around. Enter the PSP Xenon, a two-stage limiter which prides itself on being one of the more transparent limiting plugins available. To achieve this clarity, the Xenon runs 64 bit processing and up to 192kHz sample rates throughout its own signal path. This also happens to be a very versatile limiter, with multiple transient detection modes available to users. The mode setting decides how fast the attack of the first limiter will be, and subsequently determines how many transients are being passed to the second stage. Mode A is a quick limiting mode that grabs transients like a traditional brick wall limiter. Modes B & C use a lookahead mode that provides a smoother response in the Xenon’s limiting. Other features include four types of dithering, stereo linking, and K-system metering for even more flexibility. The PSP Xenon offers versatility and transparency to engineers all in one package. Having the Xenon in your chain will give you the options you need to tackle any mastering project for any genre. 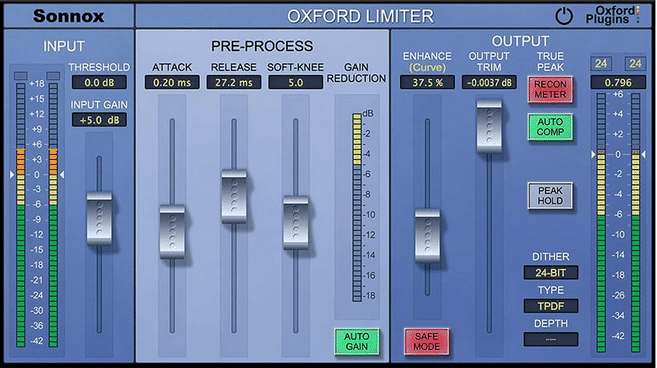 There are some limiters that offer a quick, 2 parameter operation, and then there are plugins such as the Oxford Limiter. Instead of a simple threshold and ceiling setup, Sonnox has allowed for increased control over limiting to preserve clarity and reduce problems such as inter-sample peaking. The input section is simple enough offering gain and threshold controls, but the fun comes with the Pre-Process section. Rather than having a fixed type of limiting, the Oxford allows you to set your Attack, Release, and Soft-Knee settings to maximize its effectiveness on your material. 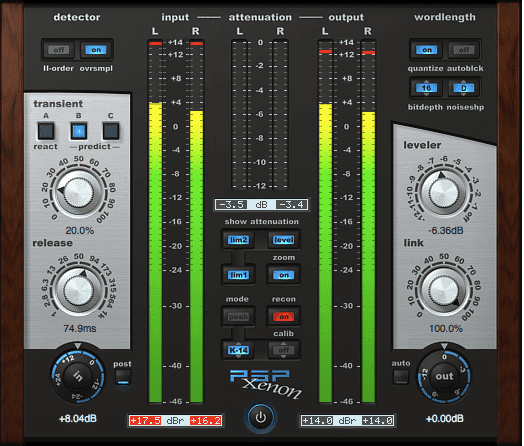 The Output section comes with an array of great features including the Enhance fader to bring up the perceived loudness without any additional pumping in the mix. On top of this, the Oxford has the ability to detect inter-sample peaks so your master will sound good even when converted to mp3. Dithering is also included on the Oxford, making this another good choice for file preparation. The Oxford’s features make for a very versatile limiter, and the sound is clean and transparent. Using the Enhance feature can yield different sounds, making it less transparent when engaged, but there seem to be many possibilities. If you need a clean, yet versatile limiter with lots of control, the Oxford may be what you are looking for. Color can do a lot for a mix. Sometimes, we are faced with mixes that just need something more, and having the right sound in these scenarios is important. The Massey L2007 has provided great limiting with four modes to help achieve that sound. While the L2007 lacks the fine control of some other limiting plugins, it provides a simple interface and some basic tone shaping abilities. The controls are simple, Threshold and Output. Outside of those controls, there are two other knobs where you can pick a setting for Mode and Release. The four modes control how the L2007 detects input. Loud takes on an aggressive limiting approach, Mellow is a little bit smoother with less aggression, Smooth can be used to soften brittle high end without the downsides of aggressive limiting, and Vibrant interacts most with midrange content making it good for preserving dynamic range. Even with all of the different settings, the L2007 maintains a good amount of transparency which makes it a great and versatile choice as well. Waves has made a name for itself in the software limiting world. The L series limiters are known for their punch and their ease of use and the L2 is no different. Offering a simplistic interface and awesome results, the L2 is a great limiter to have in your chain. 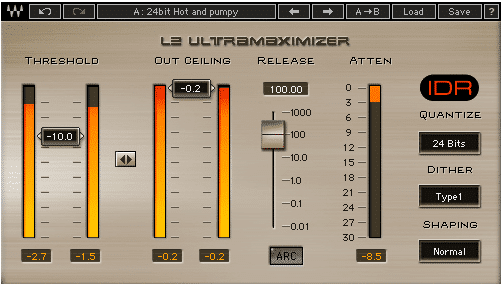 Built in dithering and noise shaping controls give the L2 even more control over the final file. Waves provides users with Manual and ARC (Automatic Release Control) to help keep limiting as smooth as possible through fine adjustment. In terms of sound, the L2 is not thought to be the most transparent limiter around, but its sound is a sound that works for many genres and it will certainly add punch to your mix. Other features of the L2 include Waves’s IDR (Increased Digital Resolution) technology that helps to preserve and increase perceptible resolution of files. If you need a bit of color and want a straightforward interface, the L2 is a great choice. We all know iZotope is one of the top choices for mastering software. Whether it’s Ozone or RX, the software is fantastic and has helped engineers everywhere. Within Ozone, the Dynamics & Vintage Limiter modules provide feature heavy and great sounding limiting options that can help take a mix where it needs to go. One of the standout features of these modules is the multi band functionality. Similar to the Waves L3-LL, control over specific frequencies can allow for finer details in limiting to be addressed. The Vintage Limiter aims to repeat the smooth compression found in the Fairchild 670, but adds the ability to use the Character control to suit it to your material. Using the Vintage Limiter will color your sound since it is looking to emulate tube gear, but a wet/dry blend is available to fine tune how much coloration you experience. Paired with Ozone’s thorough metering options and MP3 codec previewing, these limiters offer many ways to ensure that your master sounds as good as possible. Although we touched on 7 great mastering limiter choices, there are many more offering similar features, settings, and quality. It’s important to remember that there is no ‘best’ limiter; each has its own set of features, settings, and tonal aspects, so be sure to take time to audition and test a few different limiters until you find one that best matches with your transient response and production needs.